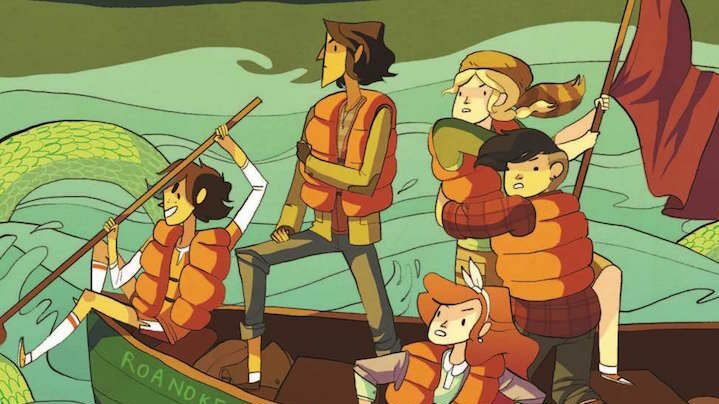 This week’s minorities in cartoons entry is “Lumberjanes,” a comic published by Boom! Studios. The comic debuted in April 2014. The creators of “Lumberjanes” include Boom! Studios editor Shannon Watters, writers Grace Ellis and Noelle Stevenson, and artist Brooke Allen. 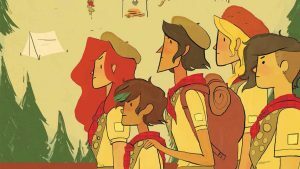 “Lumberjanes” is about a group of girls who attend an all-girl summer camp. The camp expects its “Lumberjane Scouts” to be prepared for just about anything, akin to Disney’s Junior Woodchucks. As such, the camp offers merit badges in everything—from the “String Theory” badge (learning to make a cat’s cradle) to “Robyn Hood” (archery) to “Pungeon Master” (telling bad puns). More prominently, the camp’s also the home of a variety of odd, supernatural goings-on. Our heroines fight said threats, ranging from magical beasts to demigods. The girls frequently evoke the names of famous women as exclamations; among others: “Good Juliette Gordon Low“; “for the love of Mary Anning“; “oh my Bessie Coleman“; and “what in the Joan Jett are you doing?” The most popular exclamation, however, is “what the junk? !” As you’ll notice, there’s a lot of puns in this comic. Jo: the gang’s level-headed leader. April: while prone to melodramatics, April also shows much determination, as shown in her attempts to get everyone to earn a merit badge in issue #10. Molly: she’s rarely seen without her raccoon “cap”…which is really her pet raccoon. Mal: despite her “tough” appearance, Mal’s actually friendly. Mal’s also interested in music. Molly and Mal both like each other; they’re frequently seen with their arms around each other’s shoulders, holding hands, etc. Ripley: the youngest(?) and most excitable/enthusiastic member of the group, Ripley will often launch herself into situations before someone can actually form a plan. Jen: the girls’ cabin leader, who despite her strict demeanor soon warms up to the girls (and vice-versa). Rosie: the head of the camp. The book was originally going to just be a miniseries. However, it proved so popular that it became an ongoing series. “Lumberjanes” was nominated in 2015 for the 26th annual GLAAD Media Awards’ comic book category.